I will be talking about our wedding for the next few days. What I am hoping from this post is to inspire you to do some DIY stuff for your wedding and have fun. Let me start with the rings and the invites because that’s where we started. Amit & I had researched online for ring designs and found a nice design for each of our rings. What we wanted was to show the design to the jeweller and get them made. It was difficult for me in particular to like just any ring design at the jewellers, because I wanted it to feel like “Nenya” (Galadriel’s ring – LOTR). But, everywhere we went, the jewellers said the chosen ring design was very difficult to make, and could turn out wrong. They did not want to take a chance. Finally, I resigned to the fact that I would have to choose from what was being offered. We found Amit’s ring quite easily as compared to the running around we did for mine. 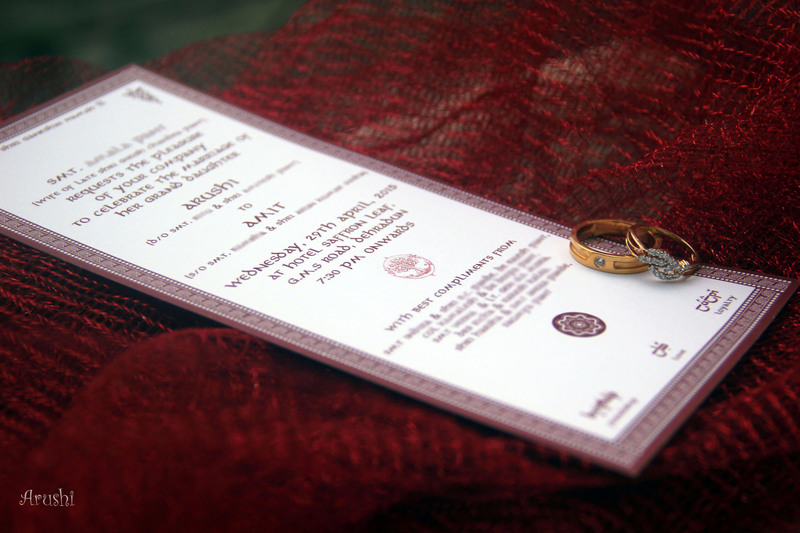 We went to a lot of places, but I was just not finding the ring perfect to be my “Nenya”. Our last stop was Tanishq. I did not like the initial lot of rings, but then I found 3 beautiful rings to choose from. I found my “Nenya” when I started trying them on, and it’s beautiful ! 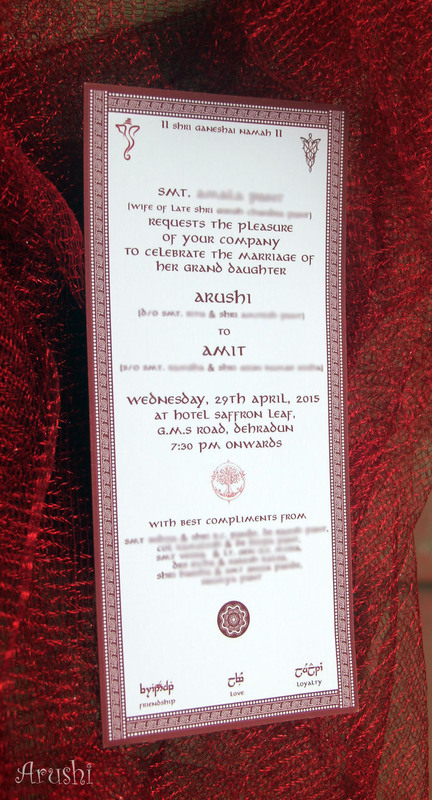 For the invite – I wanted it to have an LOTR touch, yet fulfill my parents wishes to have a Kumaoni touch and the ‘Vakratunda Mahakaya’ Ganesh mantra. I went through loads and loads of invitation samples online to get an idea for LOTR invitations, and found some really awesome ones here and here. I was doing it alone, and had a limited time, so I decided to keep it simple and not very fancy. What I was sure about was that the font needed to be an LOTR font, and the Evenstar symbol needed to be on the invite. There were loads of samples created by me, each one an improvement from the previous one, before we found the design we loved. For the Kumaoni touch, I added the Kumaoni aipan design as the border. For the LOTR touch, I added Evenstar and Gondor tree symbols, kept the LOTR font, and added three words at the bottom in Elvish script (For friendship, love, and loyalty). Most of the cards I sent by email, but family was given printed cards. We got the cards printed through Vistaprint. I loved the Linen finish cards more than the Premium thick Matte finish cards. But, if you want to add embellishments or add stickers, you’d be better off with the Matte finish. The envelopes that come with Vistaprint are plain, and it would be better to either make a new set of envelopes with handmade or decorative paper (if you have the time), or to get matching envelopes printed by a local printing shop. Message sent along with the invite in Email included a lovely “One ring..” poem I found online for a wedding invite. We are going on a quest for a ring on 29th April 2015 in Dehradun. We would love to have you join our Fellowship. Do not settle for anything less than you desire. Bring out your creativity to the full extent, and have fun making your wedding more personalized to your interests and passion. 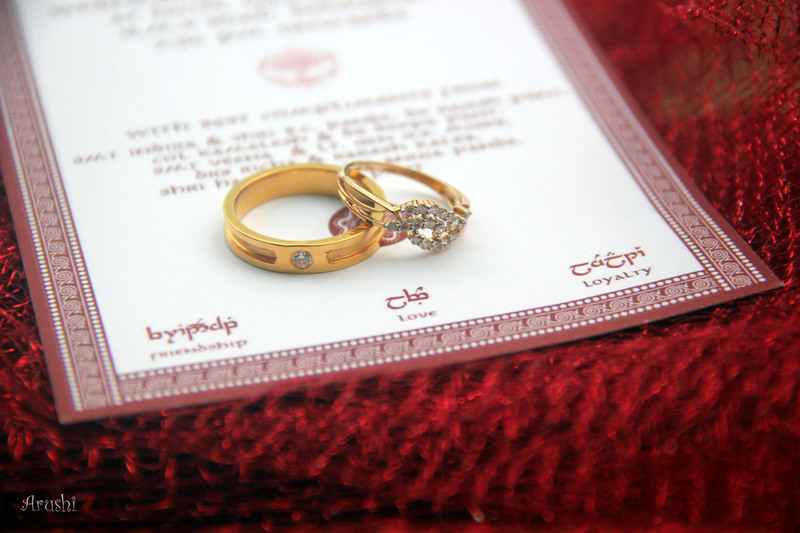 This entry was posted in Weddings and tagged invite, wedding, wedding rings. Bookmark the permalink.